This is my first post in the blog. Whats it gonna be about?? There is so much going on in my head right now. Sentimentally, wanted to start with something sweet. 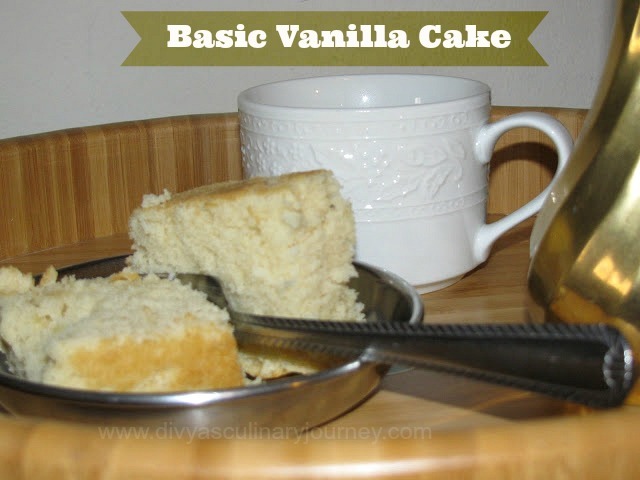 So, i took my recipe book, the first recipe was a Simple vanila cake. I thought ,why not?? So am here with it. This is the first ever cake i baked. The response was so good that i started baking a lot more. 1.Preheat the oven to 350 F.Grease the cake pan with butter and dust it with flour. 2.in a medium bowl cream together sugar and butter. Beat the eggs one at a time and stir in the vanilla extract.Then combine the flour and baking powder into the mixture and mix well. Finally add milk and stir well until the cake batter is smooth. 3.Pour the batter into the prepared cake pan and bake it for 30-35 minutes till the tooth pick or fork inserted in the centre comes out clean. 4.Cool the cake. Slice and serve as desired. Its a great tea time snack. 1. I used all purpose flour, cake flour can be used too. 2. I used warm milk, it yields soft cake.